The tag line of Spot Nuvo is: “Freshness is our mission”. We’ll see about that…if you want to make this claim, then prove it. They have a salad bar, a juice bar selection, desserts, breakfast items, sandwiches/paninis, and organic coffee. The selection was rather impressive. 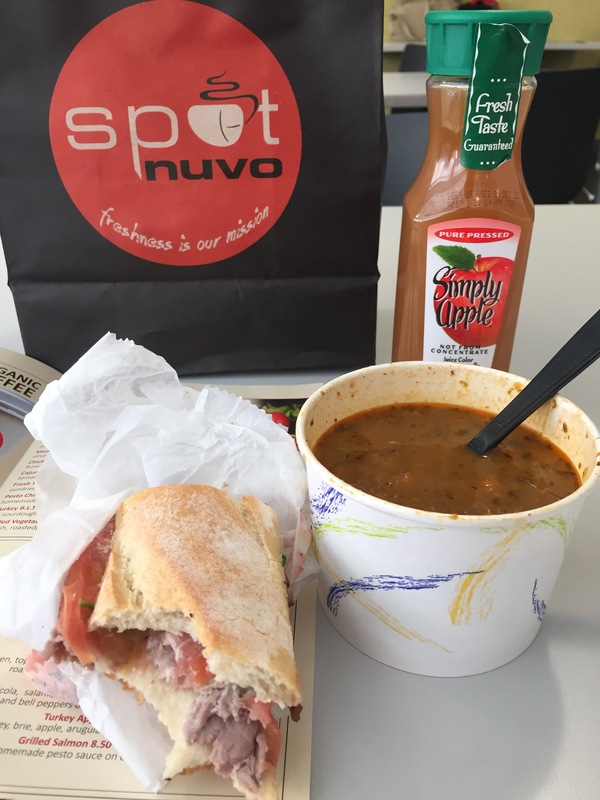 I tried the $7.99 soup and 1/2 sandwich special: roast beef sandwich with lentil soup. The soup was a little vinegar/tomato based to my taste, definitely from a can. It was just okay. The roast beef had greens, tomato, red onion (actually, it was missed), and horseradish spread on a skinny baguette. It tasted like it had Ben sitting out overnight; thankfully, the beef wasn’t dry, but it was soft, and these dark, dry bits fell out of my sandwich (I have no idea what they were). So, in a word, “fresh-ish”. It was not bad. Perhaps on another day I will try their breakfast and/or their fresh juices, for a follow-up report.